Nitrogen uptake efficiency is an important component trait that could be targeted for improving nitrogen use efficiency of crop plants. To understand the responses of different nitrate transport systems and the influence of root system architecture on nitrate uptake under limited nitrate conditions in wheat (Triticum aestivum L.) at the seedling stage, we studied nitrate uptake, root system architecture, and expression of different nitrate transporter genes in induced and non-induced wheat seedlings. Further, effects of inclusion of sucrose and two amino acids (glutamine and asparagine) in induction medium on these parameters were also studied. We observed that the induced wheat root system took up more nitrate as compared to non-induced root system in a dose-dependent manner. Gene expression of both high- and low-affinity nitrate transporter gene showed differential expression in the induced root tissues, as compared to non-induced tissues, depending on the concentration of nitrate present in induction medium. 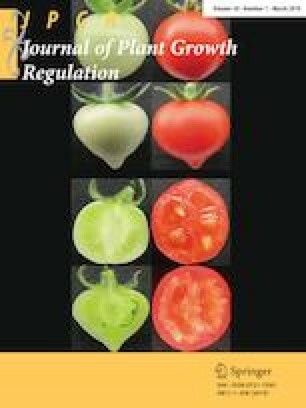 External nutrient media containing sucrose, glutamine, and asparagine reduce nitrate concentration in both root and shoot tissues and also influence the gene expression of these transporters. Our observations indicate that upon induction with milder external nitrate concentrations, the root architecture is modulated by changing overall lateral root size and 1st order lateral root numbers along with activation of nitrate transporters which acquire and transport nitrate in roots and shoots, respectively, depending on the carbon and nitrogen source available to seedlings. The online version of this article ( https://doi.org/10.1007/s00344-018-9840-9) contains supplementary material, which is available to authorized users. The present work was financially supported by ICAR-NRCPB institutional fund. Authors would like to acknowledge the Project Director of ICAR-NRCPB, New Delhi for his support and encouragement at various levels to execute this work. We are thankful to Dr. Anju M. Singh, Division of Genetics, Indian Agricultural Research Institute, New Delhi, for providing HD-2967 seeds.